Consider an outdoor film screening as part of your entertainment programme this summer! Outdoor screenings are a great way to bring communities together to enjoy a film and can offer excellent fundraising opportunities through charging audiences a ticket price for viewings. The outdoor market is one of the biggest growth sectors for Filmbankmedia, with customers typically screening 'special release' (pre-DVD) and cult titles to attract audiences. 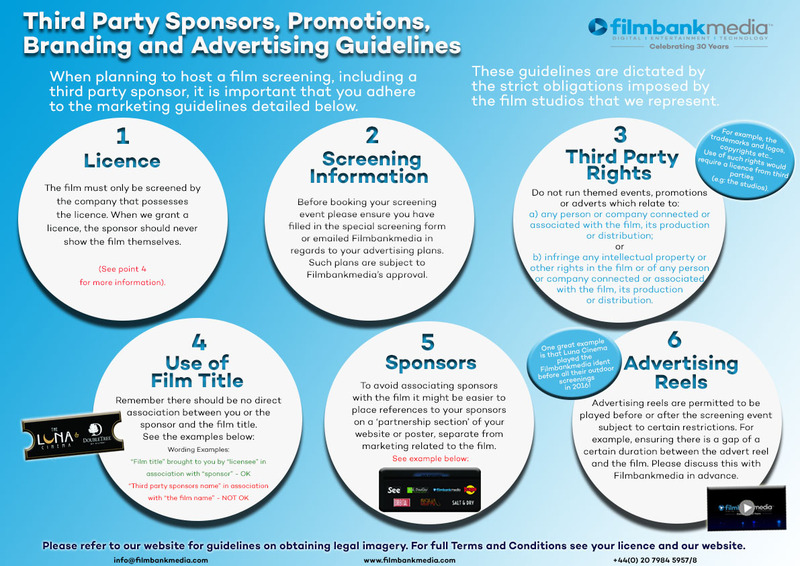 Outdoor screenings are most commonly held in environments including festivals, public spaces, gardens, marquees, car parks, patios and on terraces. The STSL is available for outdoor screenings on a Commercial (where you may charge audiences a ticket price) and Non-Commercial (where your screening is free for audiences to view) basis. Please follow the steps below to book your outdoor screening. However, if your screening involves additional activities (e.g. live music), please contact us before submitting your Screening Application Form. Please allow up to 10 working days for approval. Licence fees for outdoor pricing start from £139 or a percentage of your box office*. Please contact outdoor@filmbankmedia.com for more information. *Licence fees are determined upon receipt of your completed outdoor application request form.